Visibility: We know what job recruiters want. Our expert writers transform your career story into results using in-demand keywords. Job Search: Increase interviews from hiring managers and job recruiters who only see candidates with keyword-optimized LinkedIn profiles. What qualifications do Klaxos writers have? You will not find our breadth and depth of business, writing and marketing experience with any other career writing service. In work experiences prior to Klaxos we have worked for AOL, Aetna, PepsiCo, Kraft-Heinz, Sodexo, the National Association of Manufacturers, Wells Fargo, UPMC, Epic Medical Records, Booz Allen, Edelman and other professional organizations. 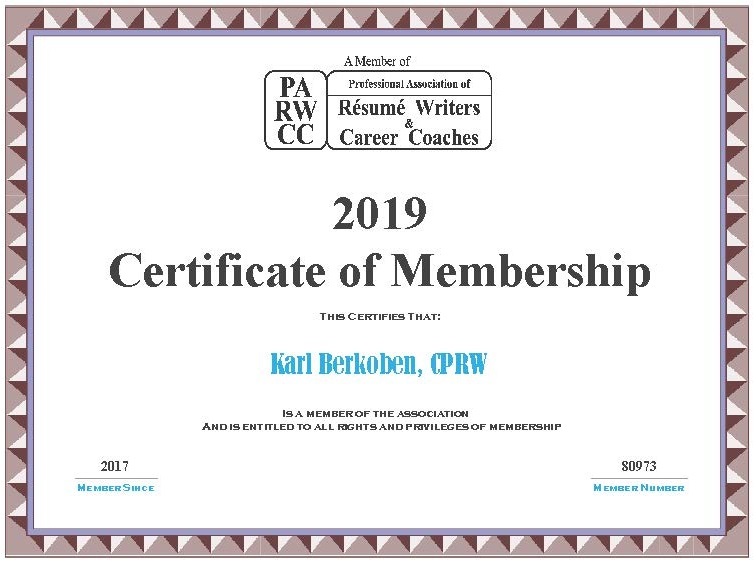 Klaxos is certified by the Professional Association of Resume Writers, has numerous 5-star ratings and hundreds of client testimonials on our website. We have a combined 100+ years of career-oriented business writing experience. Do you outsource your work to writers overseas? No. Our writers work in-house and live in the U.S. Unlike all the big name resumé writing mills, Klaxos does NOT send any writing projects to a network of freelance writers and hope they do a good job. Klaxos writers have been working and learning with the same, small internal team for many years. This continuity, combined with our industry experience, sets us above the competition. Which specialized industries or skill functions do your writers have experience with? Klaxos’ team has written profiles and resumes for over 100+ industries, including military-to-civilian transitions and academic sectors. While 80% of our clients reside within the U.S., 20% come from 30+ countries, from Australia to the United Arab Emirates. We have deep experience in technology, telecommunications, financial, health care, media, food & beverage, hospitality, nonprofit and supply chain industries. We are well-informed in current best practices and can convert your experience from one industry to another. We do not write U.S. federal government resumes and we do not write content for the USA Jobs civil service job opportunities website. Are you affiliated with LinkedIn®? No. Although LinkedIn® has asked us for our advice on new products and features, Klaxos is an independent profile, resume and marketing service. We do not have a relationship, affiliation, sponsorship, or endorsement by LinkedIn® headquartered in Sunnyvale, CA or its parent Microsoft Corporation. No content on this website or any of our services has been authorized by or represents the views or opinions of LinkedIn personnel. LinkedIn®, the LinkedIn logo, the IN logo and InMail are registered trademarks of LinkedIn and its affiliates in the United States and/or other countries. Are you the leading organization providing LinkedIn® services? Yes, we have helped thousands of clients, in 30+ countries and 100+ industries, increase their visibility via LinkedIn or through a professional resume for their job search, personal branding, generating sales leads or growing their organization in the digital age. In 2009, we first started optimized Linkedin profiles and marketing campaigns and were not aware of any individual or organization in the field offering the same types of services. When Klaxos formally launched in January 2012, we estimated 3-4 individuals offering LinkedIn services. You can read what Klaxos clients have said about the impact of our services on our website by clicking here, as well as our Yelp page and the recommendation area of Karl’s profile, Carolyn’s profile or Christian’s profile. What do job recruiters think of your resume layout? The resume layout Klaxos uses follows the guidelines promoted by the Professional Association of Resume Writers, the Society for Human Resource Management and executive recruiters. The science behind the layout is intended to increase your visibility with resume scanning technology and humans and it is what job recruiters are expecting to see. You can see our resume example here. Why is your resume layout more successful than resumes with fancy styling? Applicant tracking software (ATS) is an algorithm that scans and ranks your submitted resume. Then, a human will review the top 5%-10% of applications based on the ranking assigned by the ATS. ATS’s cannot read resumes that contain logos, pictures, symbols, tables, fancy fonts, headers, footers, colors and shadings. 90% of recruiters read resumes on their phone, fancy formatting makes the resume distorted and impossible to read. Our resume format makes it more likely to pass ATS filters and be reviewed by a human job recruiter. Resumes with unknown headings like Affiliations, Publications, or Memberships may cause the ATS to reject your resume. Although an ATS can usually read a PDF, it is better to submit your resume in Microsoft Word. Klaxos uses Calibri font which is a narrow sans-serif typeface like Arial/Helvetica, thus allowing more characters per line. 1. Tell us about your goals, skills, accomplishments, work experience, other information and upload your old resume via our online questionnaire. 2. We will match you with one of our in-house, expert writers who is knowledgeable about your field. 3. After we receive your completed questionnaire, your writer will email you the Word document within 4 business days. 4. You have 30 days of access time to work, one-on-one, with your writer on revisions. 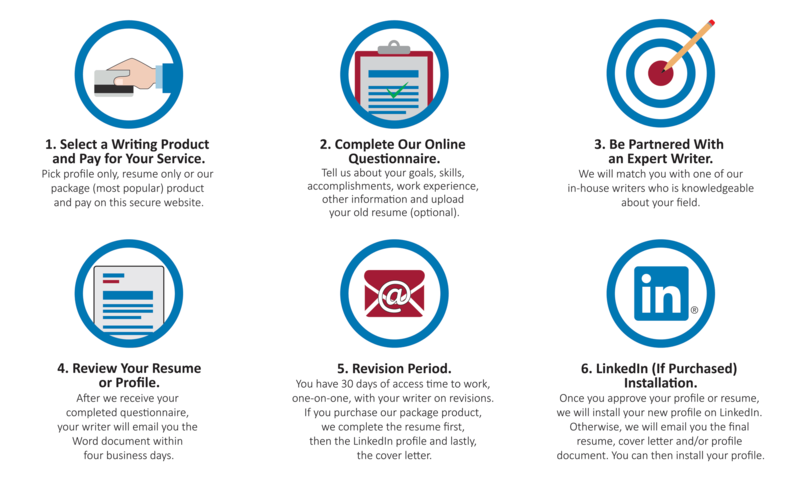 If you purchase our package product, we complete the resume first, then the LinkedIn profile and lastly, the cover letter. 5. Once you approve your profile or resume, we will install your new profile on LinkedIn. Otherwise, we will email you the final resume, cover letter and/or profile document. You can then install your profile. How many revisions will my writer provide? Purchase of our writing service provides unlimited revisions for 30 days. Other writing services only provide 7-14 days for revisions. After we receive your completed questionnaire, your writer will email you a draft document within 4 business days. For package products, it typically takes 6-9 business days for the resume, profile and cover letter to be completed. How does the 60-day interview pledge work? Not only do we professionally write your resume, we want to make sure it gets you results. For resume and profile writing services, if you do not receive two times more job interviews within 60 days of the end of your Access Time, we will revise either the resume or profile once, free-of-charge. You must notify us, via email, between 91 and 150 days (approximately 5 months) from your date of purchase, to be eligible for a free revision. Will this require a lot of work by me? No, but this is an interactive process—you are the expert on your specific experiences, skills and goals. Your writer will need your collaborative input to provide information in our short questionnaire. The writer will improve, highlight, align, format, adjust, boost and edit the raw content you provided initially and during revisions. The writer cannot guess! How does not having phone support benefit clients? 1. Written communication encourages concise direction. Verbal communication often results in 60 minutes of repetitive and off-topic discussion to transmit 10 minutes of actionable information. 2. Written direction, via email or webpage questionnaire, ensures direction is not confused in a verbal discussion. 3. Written text provides an exact record of what was said, by whom and when. 4. Written information can be read and transmitted at a convenient time. 5. Scheduling phone meetings is time-consuming for both parties. 6. Most people learn better through visual tools. We can email you resources like articles, videos or personalized instructions to help you solve problems and get back to working on your career. What topics are discussed during the paid phone consultation? Topics discussed can include learning more details about your skills, accomplishments and goals. The Klaxos consultant answers questions about our services and provides advice regarding job searching, LinkedIn, recruiters and other career topics. If you would like to pay for a separate phone consultation, click here to pay for an up to 60-minute voice phone call with the Klaxos consultant. How do I cancel my membership in the Klaxos LinkedIn Library service? What a-la-carte services do you offer? We have packaged our services based on what most clients request, however, we realize your needs could be unique. Review our unbundled a-la-carte prices. What free resources regarding LinkedIn, resumes and job search tips do you have? We have a blog that covers all things career advice related—from interview tips to networking to resume writing. Check out our resources webpage. What LinkedIn® B2B marketing and social selling services do you offer? LinkedIn is the leading channel for B2B social sales and advocacy engagement. Gartner, Visa, Bloomberg, Sodexo, FujiFilm, multiple trade associations and several educational institutions have retained Klaxos to train sales teams, increase lead generation, manage LinkedIn advertising campaigns, write LinkedIn business pages and be the keynote speaker at conferences. What does the Klaxos name represent? On June 8, 2018, the name of our business changed from LinkedIn Profile and Resume Writing Service to Klaxos. The Klaxos brand is inspired by the Klaxon, a horn that combines electronics and mechanics to make a loud, recognizable noise alerting people of critical information. Listen to an audio example by clicking here. Similarly, Klaxos combines digital technology and human intelligence to enable organizational and personal brands to make intelligent, relevant digital noise that overwhelms competitive clatter. We are a leading provider of LinkedIn writing and social selling training services that can increase visibility for job searchers, salespeople and organizational brands.